NileZ from NileZ.com is a self-proclaimed Mad Scientist. 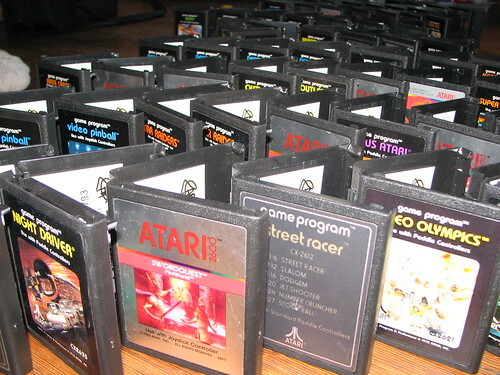 Among other things, this guy makes wallets out of old Atari 2600 game cartridges. (Or, as your mother used to say, "Atari tapes.") From the site itself: "Wallets are repurposed from 100% original Atari 2600 games, selected for their high quality labels from thousands. Each one is assembled by hand and requires over 2 hours to repurpose from game to wallet. The only piece of the original game not used in the wallet design is the screw." Now, while I can't see that as comfortable jammed in my back pocket, the FAQ says you're better off carrying any wallet in your front pocket, anyway. At $35 to $55 US they're a little out of my "buy it just because it's cool" range, but given the labor that goes into making one of these, I guess it's a fair price. So check out the home of the Atari wallet and stuff, or just jump in and buy one at Etsy.